Habitat: Desert. This weed grows in disturbed areas, along roadsides, in fields, and in drainage ditches. 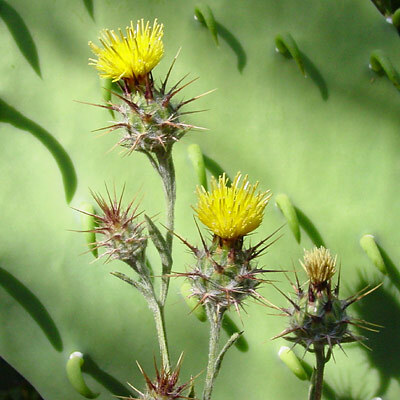 Description: The 1/2 inch (1.3 cm) wide flower heads are surrounded by spiny, cobwebbed bracts. The floral spines are tan-colored, 1/2 inch (1 cm) long, and have a reddish, pinnately spined base. These spines are painfully sharp and can cause injury to grazing animals if the plants are eaten. The upper leaves are linear, while the lower leaves are pinnately lobed. 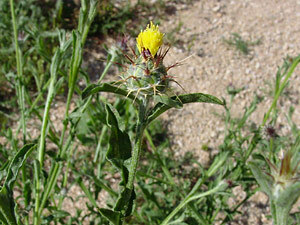 The similar Yellow Star-thistle (Centaurea solstitialis) has longer, yellow spines. Poisonous – This plant can be poisonous to horses.